Two weeks down and the market at MONA has been amazing. 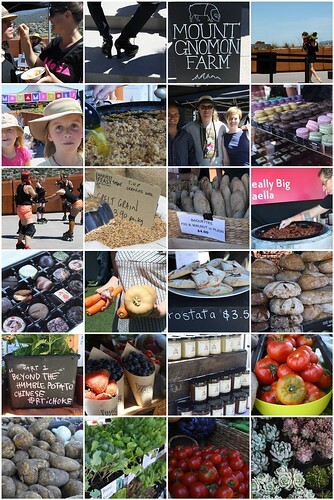 There have been so many people coming to enjoy the market, the music and produce available. The beanbags on the grass have been a huge hit with families and young hipsters alike, settling into an afternoon of music and good food, whilst leaving their shopping in the free fridge cloak room. I've eaten Asian omelettes full of crunchy vegetables, ice cream that makes you moan it's so good, incredible cheeses, crusty bread, cold pear cider and I think my children have eaten their body weight in Gillian's chocolates. Establishing a market is not without its teething problems, and we've still loads of work to do until the market finishes for the year at Easter to maintain the momentum. There are lots of more exciting things to look forward to over the coming weeks, new stallholders, new art installations and lots more delicious things to eat. I'm having a couple of weeks off selling jam, and will get back into it once school holidays are finished. In the meantime, Saturday was a good excuse to be a shopper, listen to Guy and Eliza's entertaining talk and take lots of pics. It's incredible to be working at Mona, and to be part of such an inspiring beast, we are very lucky to have it here in Tasmania. it sounds amazing, my type of market, wish i could come. the photos look so earthy and gorgeous. enjoy! I'd be your first subscriber in a heartbeat!! You are such a Clever clogs missy. SO happy it is going great guns. More glad to hear you are giving yourself a jammy break till school goes back. Odd question but how do create the montage of photographs you have made in this post. I would love to do one but have been using Word and it leaves gaps between images. Very frustrating. The images of the markets look fantastic. I will definitely put Moma markets on our to do list on our holiday to Tassy. I can't wait to see what else you two have in store!